Just one more month and a week until departure, I’m getting thrilled. I managed to complete most of my bookings and my itinerary is done. I want to tell you about it in the next five articles. I guess this map needs some explanation. I ordered the destinations I want to visit in different colours by region. The black lines resemble the (mostly train) lines I will take to travel from one city to another. Some destinations I’d like to visit though there was no time to do so in my schedule are marked with a circle. As you can see I will travel quiet a bit. Almost every day I will change the destination and take a train for several hours. Preface – What is my motivation? I was asked quite often why I would do such a thing – it’s supposed to be a vacation, right? I should relax and don’t stress myself. I see it a bit differently. For me this trip is not vacation but a journey if you want. Since my budget is limited and I have very much no control about my vacation dates since I’m in university I can’t go to Japan very often. That’s why I want to make the most out of these three weeks, the only chance for me to go abroad per year. Most of my friends and acquaintances who travelled to Japan before or are planning to do so come there for a week or two. They’ll fly to Tokyo, explore the fascinating capital for a few days and then take a Shinkansen to Kyoto where they visit the tradition-rich former capital like every trip guide you can buy would suggest you. And that’s of course totally fine. This does very well for everyone coming to Japan for the first time. But I’m going there for the second time so I saw pretty much of the top tourist spots already. This time I want to go off-track and explore areas that are not so well-known and still have their very authentic aura. I’m a person who can’t sit still. When I have the chance to be a in a foreign country on my own for this amount of time, I do not want to sit in Tokyo for two weeks. Don’t get me wrong, Tokyo has sooo much to offer, like these two bloggers show impressively by staying for 91 days and exploring something new everyday. But in my opinion there is much more beyond the capital and the three biggest cities. The consequence of my mindset is clear, I won’t be able to explore every city in very much detail since I’m leaving much too early again. But I will certainly come again and take my time once I know where to go. My ambition is to see much of the Japan I couldn’t see on my first time. 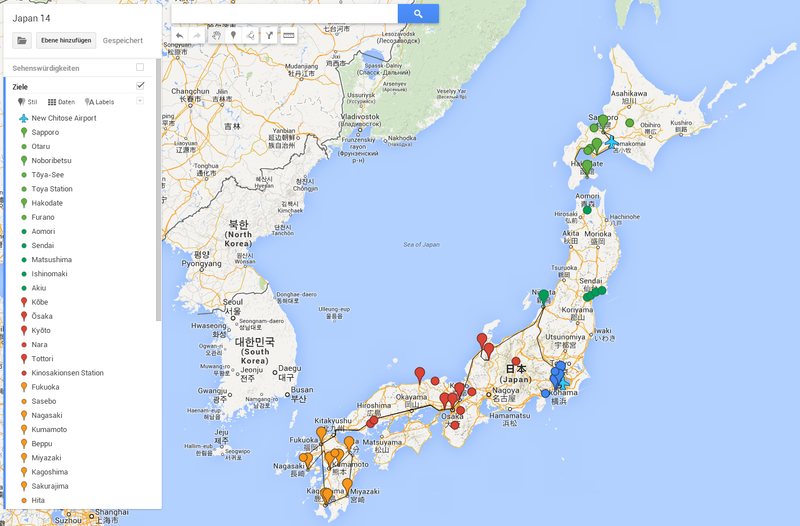 This means I will scale-down my Tokyo and Kyoto time in favour for going to Hokkaido and Kyushu for the first time. Thanks for bearing with me for so long. So then let’s start with my travel schedule! This time my journey won’t start at Narita airport in Tokyo, like last time, but at New Chitose airport in Sapporo. I will take a flight from Zurich with two brief stops in Helsinki and Nagoya in order to get there. My flight touches down around 3 pm on Monday, so I will try to find my way to downtown quickly and will check into a hotel in the center of the town. I will stay for about two days in the northern capital of Japan and will pay a visit to the near coast city Otaru, too. Sapporo is famous for its regional Ramen interpretation as well as its seafood cuisine. The local beer brewery with the same name is internationally recognized. There is much to see in Sapporo, I certainly will check out the local beer museum and nightlife in Suzukino. If I ever make it to Japan in winter I just have to visit the Snow Festival. Every February fantastic sculptures are made – entirely out of ice! On Wednesday I will hop on a special bus bound for Noboribetsu. The small town at the south coast is famous for its onsen tradition and I will stop by a night to enjoy the hot water from up to seven different springs, called hells (地獄). Hopefully I’m acclimated to the time zone and the climate until then. On the next day I will take the train. Since I bought myself a Japan Rail Pass, a pass for unlimited travel on (almost) all local and express lines for a set of 14 consecutive days, I plan to start using it on this day. I planned my trip in such a way that I will profit from my rail pass every day and use the express train network to travel large distances between cities. I will travel along the south coast of Hokkaido bound for Hakodate. Before I will arrive there I might do a brief stop in Toya. The national park includes an inactive caldera volcano which formed a lake with a small island in the middle. 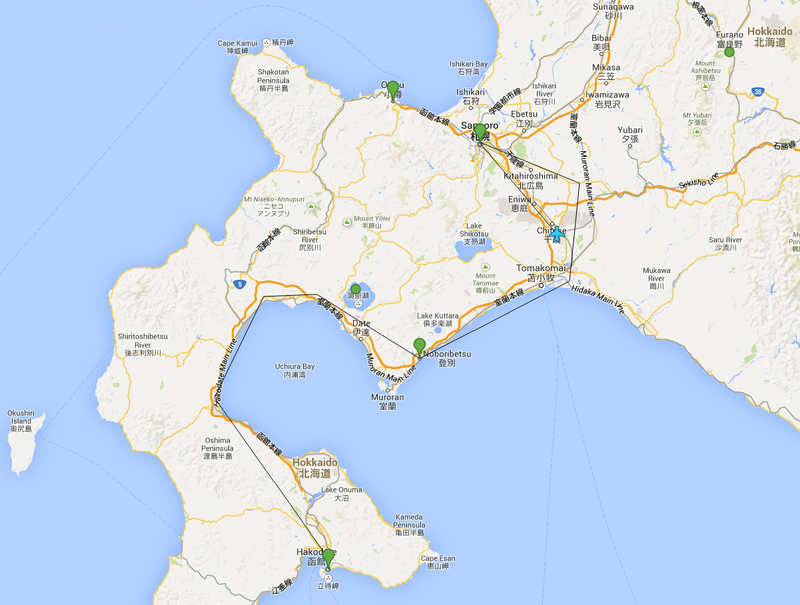 After that little detour I will reach my last destination on the northern-most main-island: Hakodate. The city lies at the south-coast of Hokkaido, has a small airport and has a direct train connection to Honshu. How? By an underwater train tunnel! Pretty amazing, but I don’t have the time to try it out. Like Nagasaki, Hakodate opened its harbour early to foreign traders leading to western influences that still can be seen. The main attraction is definitely Mt. Hakodate from where you have a splendid view over the town. I’m really looking forward to it. This time I won’t make it to Tohoku. 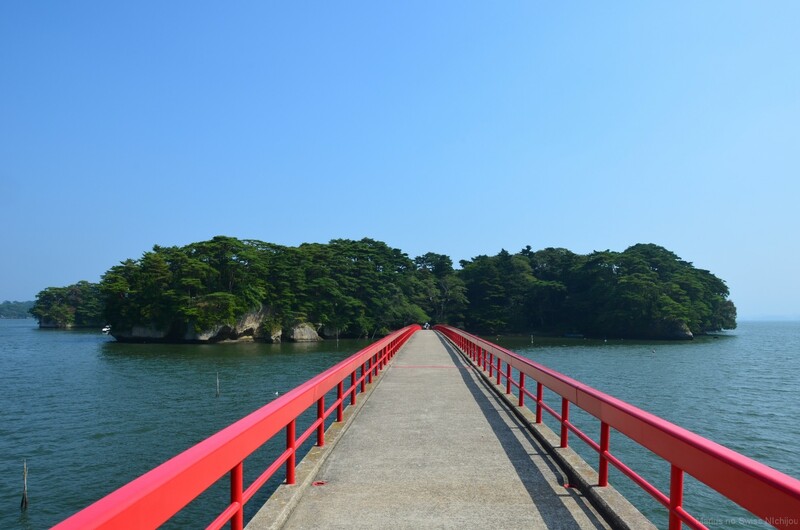 I enjoyed travelling there last time when I spent a day trip from Tokyo in Sendai and Matsushima. Especially latter really took by breath because of the scenic landscape and the peaceful atmosphere. I decided to visit the pine islands again, but not this time. In order to be on time for the Magical Mirai concert on Saturday I will take the plane to Osaka instead, going back to Chitose from Hakodate on Friday afternoon. From Osaka airport I will reach Kobe in the early evening – if everything works out. Last time I spent most of my time in the lovely harbour town and met lots of amazing people there. Kobe will be by base for the second part of my journey. From there I will explore the Kansai area.